A Special Needs Trust is also known as a Supplemental or Discretionary Trust. The basic concept is that the trustee has discretion on how the assets are spent on behalf of the beneficiary with a disability, and the beneficiary does not have any access to income or principal of the trust. The trust supplements the government benefits and does not supplant them. Since the trust is irrevocable, the trust will own the assets, and not the person with the disability. That is the magic that makes a Special Needs Trust work! All assets are owned by the Special Needs Trust, and not by your son or daughter, thus, keeping them eligible for government benefits. Social Security Administration even has a regulation found in the Program Operations Manual in which Social Security defines that Special Needs Trust are to be irrevocable. Not only does it meet the government regulations, but an irrevocable trust keeps the assets out of the estate of the individual with the disability. An irrevocable Special Needs Trust also encourages other family members to give to the Special Needs Trust, whereas they may not do so if the trust is part of your estate.. Determine your desires. Know what you want to do with your home. Who will be trustee, who will be advocate or conservator. You should have backup choices and determine how you want to distribute your estate, and how you want to distribute the special needs trust upon your child's demise. Don't forget charities. Many organizations that provide services to our population need our support. Even a small gift to the organization that helped your son or daughter would be greatly appreciated. After your son or daughter has passed on, what a wonderful time to leave a legacy. Estate planning is an ongoing process. The one thing constant in life is change. People move, children grow up, circumstances change. Estate planning addresses the issues we desire. 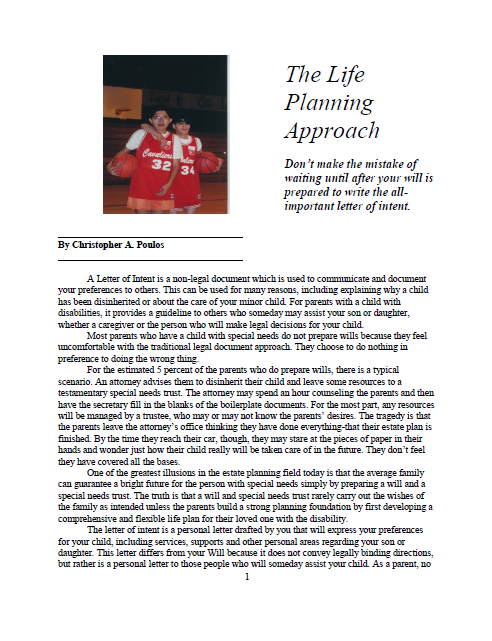 A plan written ten years ago may not be the plan you want today. Don't be afraid to update your plan. Your failure to do so may result in a loss of benefits. Decide future housing. Will your child live in your home, a group home, with relatives or in supported living? Whatever your wishes are, your plan must be in writing and legal. Remember, your plan can change, but make decisions and don't pass the buck. Talk to others. An estate plan can be devastated if our successors do not act in the role we desire. Talk to your family and let them know what your plan is and find out now, not later, if they can help you. To make sure that there will always be someone to look after their child when they are no longer around. That their children continue to receive basic government benefit programs (SSI and Medicaid). To leave enough funds so that their child will always have the extra things that they now offer. To find someone to manage the trust funds who is trustworthy. To assure that fifty years from now that their child be given dignified final arrangements. To avoid lengthy probate processes. To trust some professional to put things into place. Even though we have these concerns many families don’t plan for the future of their children. Less than 50% of families with children with disabilities, take the time to prepare a Will. Those that don’t find out the hard way that their children all stand to receive an equal inheritance. When the person with the disability receives the inheritance and loses their benefits, or the money is squandered, the inheritance does not result in a gift to the individual but a gift to the State and Federal Government. It’s not that families don’t worry about the future, but studies show that families may cope with their situation by emphasizing the present, and living one day at a time, or cope by avoiding communication about the family member’s disabilities. Lack of adequate or desired services may be a further barrier to planning, as well as not knowing where to go to get the appropriate help. Common factors that motivate families to do planning for their children are: 1) significant occurrence such as vacation, or death or illness to a care giver, 2) financial issues/financial planning, 3) concerns raised by other family members, 4) attending an estate planning seminar. I hope this website will motivate families to plan. All too often when it comes to planning the future for a person with disabilities, all that a family does is contact an attorney to prepare Last Wills and Testaments. The person with a disability is excluded from a direct inheritance and a sibling or other family relative, is left with a few dollars to take care of the loved one with special needs. Tragically one of the first steps in this process, preparing Last Wills and Testaments usually becomes the only step. A Will, and even a living trust, is not a complete estate plan, especially for those families who have a developmentally disabled loved one. The average attorney, like the typical member of the community, rarely has the background and the experience in the world of disabilities to provide adequate counsel, and the average family rarely has the financial resources to pay for the attorney’s education in the specialized field. It is relatively easy to find out whether or not your attorney has the expertise in this area, just by asking him a few simple questions in regards to SSI benefits. How much money can a person with disabilities have in their name? What are some of the exempt assets that a person with disabilities own? How many Special Needs Trusts have you drafted? A proper Estate Plan for special families will not only include planning for your estate but will also create a separate estate on behalf of the person with a disability, which is designed to provide a comfortable standard living with maximum amount of government benefits. This usually involves disinheriting the child with disabilities in the parents will and leaving that child’s share to an Irrevocable Special Needs Trust, which will manage the resources in such a way that the requirements for benefits will never be violated. The use of a Special Needs Trust will solve the problems we listed above, such as protecting government benefits, avoiding probate, leaving sufficient funds, and providing final arrangements. Proper planning solves other issue such as avoiding family conflict. By setting a plan in place and writing a letter of instructions, you will leave no doubt as to your intent, and will name the successor trustees and conservators to make sure that there will always be someone to look after your child when you are no longer around. A Special Needs Trust is different from a Support Trust. Most family revocable trusts are considered Support Trusts, because the trust is to provide for the health, welfare, maintenance, comfort, and support for the trustors during their lifetime. Under existing case law, a Support Trust cannot be used on behalf of a disabled beneficiary, as the courts reason that the trustee has the power and duty to care for the general welfare of the person with a disability and the trustees powers and trust purposes are identical with SSI’s goal to care for the general welfare of the person with a disability. Since SSI has helped fulfill the purpose of the trust, SSI may pull the benefits and charge for overpayment for past benefits paid. This is why it is important to seek counsel from someone who knows how to plan for your son or daughter’s future. Since the parents are the creators of the Special Needs Trust they can dictate the terms of distribution upon the demise of their loved one. The funds may go to the other remaining children or family members. Families may also want to consider gifting to their trustee, guardian or conservator for their support for their loved one during their lifetime. Also, at this point in time, charities ought to be considered. Charities which are near and dear to your heart, would greatly appreciate a gift. Without such generosity, such organizations may not continue to exist in the future in light of current budgetary restrictions on government programs assisting disabled individuals. Although it is an area not often emphasized by Estate Planning attorneys’, each family should strongly consider those programs that have benefited their child during his or her lifetime, and make a gift in accordance as they set in their heart to do. Our office believes that our unique experience of working exclusively with families of children with special needs gives us the specific knowledge to accomplish what you desire for your family..
Family comes first. In all aspects of your plan from trustees to distribution, we can design your plan with checks and balances to assure continual oversight and supervision. If you don't have family members who can help, our office has knowledge of professional and institutional options to help you solidify your plan..
Our focus is on the person with the disability. Other lawyers may focus on you or tax planning, but we help you and your family accomplish your desire to provide lifelong care, supervision and advocacy for your loved one with a disability..
Housing needs are addressed. Your child with a disability at some point in his or her life will face the question of where will I live after my parents pass on. We can utilize your family home as a planning option for independent supported living or family support. Even if you already have a living trust, we can help you fill in the gaps in your plan regarding housing..
Funding the special needs trust. Many practitioners overlook this part of planning. Insurance agents want you to overfund the trust, while attorneys don't know how to calculate funding and often underfund the trust. Our office has found that funding is a byproduct of good planning. Determining an appropriate amount and how to fund the special needs trust is unique to every family situation. Detailed information must be discussed including future housing, costs of ongoing and future services, ongoing and future special needs, as well as use of service resources such as SSI, IHSS and Regional Center services. We believe it is important to assure funding in the special needs trust. Funding is important, planning to fund is essential. Don't leave your plan to chance..
Estate planning is like building a house. You have a lot and your want to build a house. First you must draw plans. Then you start building your framework. You make corrections, inspections and then you move in. After a few years, things change, you want an addition. Since your framework is laid, and your plans are adaptable, it is easy to add on and you don't have to start over. Similarly, for special needs trusts, you have money and want to plan for your children. First your draw your plans by meeting with an attorney. Then you start building your framework by creating wills, living trusts and special needs trusts. You make corrections and finalize the fund. After a few years, things change, you make an amendment to your plan. Our philosophy is that one thing is constant, that constant is change. We believe that estate planning is an ongoing process. Our office works with you in developing plans that are easy to change so that you don't have to demolish the whole house. .
A letter of intent, which might also be called "family instructions," "child's history," or "future care plan," serves to communicate to your heirs or friends what you desire for your child with a disability. History is important because even your own children may not realize events that have occurred in your child's life. Since the letter of intent is a communication tool, it can serve many purposes. It can serve to explain why you made your distributions the way you did, to help ease disappointments or family conflict. It can serve to explain what you desire for housing for your special needs child. It can provide information to your successors about the type of special needs to be provided for your child. The bottom line is that the letter of intent is a flexible document that is personal to you and can be used for whatever purposes you dream up. So change and update your letter of intent yearly and be creative.